What is the Clementine Moon mapping mission about? Is this the first Clementine mission? What is the real story about Clementine and the DoD connection? Some have thought that Clemetine went black (or classified) after launch, but the truth now appears that it was a black project from the beginning. There is word circulating now that more than 100,000 Clementine images will not see the light of day because they have been classified. Perhaps many of these hi-resolution images discovered artifacts, just as I found dozens of articial artifacts and signs of life on Mars using NASA data. Or perhaps UFOs were imaged on or near the Moon that we are not supposed to see. To do so, would require Uncle to admit they have known about UFOs for years. And it seems to date no one in the government is willing to take the flack for hiding it for over 65 years. A crude, weird, elementary-school-like logo shown below from the USGS government website clearly shows the DoD/NASA connection. It also has considerable symbolism embedded within it as we shall see. On all logos and currency, every symbol and object appearing on them is there for a reason, and is usually derived from some kind of philosophy, mythology or an event in history. * Three stars are shown on the shield, and three more in space are shown below the right elbow of the figure. Three stars could mean a number of things, although globalism is often associated with 3. And the coming North American Union is also a combination of three countries. * Is she holding the shield (which appears to be UPSIDE DOWN) or just hiding her hand behind it? * The hidden right hand can be symbolic of a black ops mission. * And although through international agreement the Moon belongs to no one, a US flag is clearly shown standing on the Moon. The woman appears to be defending this position. * Did you also notice something else here? LOGO SHOWN IDENTIFIES CLEMENTINE AS MISSION NUMBER 9! We never heard a word about missions 1 through 8 or what they were. * The vertical lines below the #9 seeem to imply landing and take-off site trajectories, very similar to the Apollo missions. * Perhaps the figure is supposed to be the Godess Apollo. And how many planets WERE there in our solar system before Pluto was recently demoted to a planetoid? Nine of course, including our Earth. Could it be that the other Clementine missions took place to map ALL the other planets? Were the results of an earlier classified Clementine mission to Pluto the impetus for changing Pluto to a planetoid? Neither Voyager 1 or 2 ever reached Pluto. 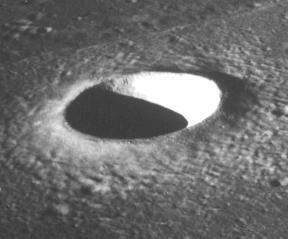 Perhaps the government found so many signs of life on the Moon it put a tight lid on much of it? Could the Clementine Moon mission images be the reason why suddenly Bush (DoD commander in chief) wants MANNED missions to Mars AND the Moon? US government follows corporate rules in naming divisions. For example, in the civilian world when a company or individual buys another company and the buyer keeps the subsidiary's name, the buyer's name comes first. It was this way with "Cooper Price Waterhouse" when Robert Cooper bought them. (I think it's since dropped Cooper from the name.) Or "Cooper Weller Tools." Here we also see the DoD name coming FIRST - yet it was NASA who designed and launched Clementine! It's clear who flipped the tab for Clementine. I received considerable heat for an essay a few years ago that NASA is part of the DoD. While this logo doesn't prove this is always true we do know for a fact that numerous shuttle missions ARE DoD missions, and it's clear that DoD is paying for them. Is the true color of the Moon's actual base material yet another lie? Is there any evidence to support this theory? Consider the ancient age of our closest "natural" satellite. With the lower gravity the Moon has at just 1/6 that of Earth, it also acts like an orbiting vacuum cleaner. All the interplanetary rocks, dust and dirt which enters the Moon's gravitational field would ultimately end up on it's surface. Like Earth, our Moon does not have an asteroid belt as some of our outer planets do. Shown below is the landing area for Apollo 11 as photographed by the DoD sponsored Clementine. * Why are almost all of NASA's Moon images black and white? Color has existed for more than 50 years. * Why did the DoD sponsor Clementine? * What are they up to now? The DoD is a MILITARY organization. The US Space command is part of the DoD. * Could Apollo have been sent to this area to explore Moltke? * Did Apollo actually land much closer to Moltke crater than this image shows? * Why is this image so blurry considering the high quality imaging camera Clementine has? The spacecraft's imaging camera is several generations better than the best Nikon camera you can buy today. It was announced a few years ago that Clementine would be using spy satellite technology to image the Moon, but the public hardly took notice of it. Must we accept fuzzy Moon images? ALL of the Clementine images should be razor sharp, and are until the dumb-down factor is added to the released images. Everyone is sick of Uncle's games that he never stops playing. Graphic notations added by USGS only. What is the dark line at the 8:00 position radiating from the center to the outside? There are also other symmetrical radiating lines at the 11:00, 1:00 and 5:00 positions. Some other radial lines are also present in this image. Is this object labeled Moltke by USGS really an artificial structure? Or is it the true color of the Moon's base material? Does this image remotely resemble the one shown above? Does this make sense? Perhaps the greenish color of Moltke crater IS the real color of the Moon's base material. Either that, or THIS ISN'T MOLTKE CRATER. If this is Moltke and the black and white image above is wrong, then there is a BIG problem with mainstream thinking about the origins of the Moon. The greenish color indicates the Moon is NOT made of ordinary rock material like Earth, and that the Moon is an artificial construct. This thought is something I expounded upon more than a year ago in another essay titled, "The Moon - What Is It and Who Made it?" Clementine may have proved my theories are on target. And if the Moon is indeed an object foreign to our Solar System, it would explain the DoD interest in visiting it. To summarize, there is a BIG problem with the Moltke crater and what it really is. Now if only we could get some answers. I have already proved that color shifts were made by NASA with almost all Mars images in order to make the planet appear red. And up until now, no one else has talked about the fact that Clemetine is openly labeled as Mission #9 by the logo it uses.